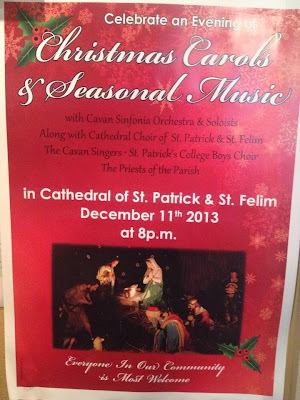 In the mildest winter weather for many a year, we joined in the seasonal celebrations in Cavan Cathedral, where our former Chair (and bass) Fr. Kevin Donohoe is currently the ADM. This is the program for the evening, which was attended by a large appreciative congregation. It was great to be part of such a wonderful evening. It was a honour to be involved on such a wonderful service.